Audi A3 Saloon Performance, Engine, Ride, Handling | What Car? Our favourite A3 engine is a punchy 148bhp 1.5-litre turbocharged petrol (badged 35 TFSI). It balances strong, flexible performance across the rev range with decent efficiency — it can shut down two of its four cylinders to save fuel when you’re cruising along. 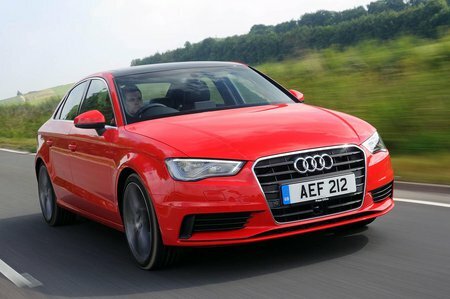 It's a better match in the A3 than the 114bhp 1.0-litre three-cylinder petrol (30 TFSI) if you spend a lot of time on the motorway, but even that's plenty pokey enough around town, you simply need to rev it harder to get up to faster speeds. The 2.0-litre with 187bhp (40 TFSI) proves decidedly quick, but high running costs count against it. The diesel options are more likely to attract company car users, and have plenty of merit. The entry-level 114bhp 1.6-litre engine (30 TDI) seldom feels underpowered, while the 148bhp 2.0-litre engine (35 TDI) pulls hard across the rev range and would be our diesel of choice. There's also a more powerful 187bhp 2.0-litre (40 TDI) if you need more go. Most of the engines come with a six-speed manual gearbox as standard, with a dual-clutch automatic 'box (S tronic) available as an option — this is standard on the 40 TDI and 40 TFSI. The auto 'box shifts quickly up and down its gears but can be hesitant from a standing start. Another feature is Audi’s four-wheel-drive system, quattro, which gets you off the line quickly in slippery conditions. It’s available with the 40 TFSI petrol as an option, and standard on the 40 TDI, S3 and RS3 performance models. Speaking of which, the S3 comes with an even more powerful 2.0-litre turbocharged petrol engine and, combined with that four-wheel-drive system, is the real McCoy when it comes to high-performance saloons. As for the RS3, its astounding performance would shame the supercars of yesteryear. For the record, both the S3 and RS3 are temporarily off sale, pending approval of their WLTP fuel and emission testing. There's a trick to getting the most comfort; keep the standard (softer) Dynamic suspension that you get with our favourite Sport trim, rather than upgrading to the stiffer Sport suspension that's also available. Or, if you're buying an S line trim or above, swap the Sport suspension that comes as standard for the Dynamic option, which you can do for no extra cost. That will get you a suspension set-up that blends good bump and pothole absorption with a decent level of body control. We'd also opt for Sport trim over S line to get the 17in alloy wheels —the bigger 18in wheels that come with S line hurt the ride. Sport suspension (the one that's the default on S line, as opposed to the Dynamic suspension you get with Sport trim — sorry, we know it's confusing but don't shoot the messenger) drops the ride height and has stiffer springs: it's firmer and harsher, but just about bearable. The A3 Saloon changes direction eagerly and there’s enough grip for the car to stay easily in line if you’re trying to hustle it along a twisty B-road. It doesn't roll too much in corners, either, even with the softest Dynamic suspension fitted. Regardless of which set-up you go for, the A3 Saloon’s steering is precise and has consistent weight, but doesn’t offer a huge amount of feedback. 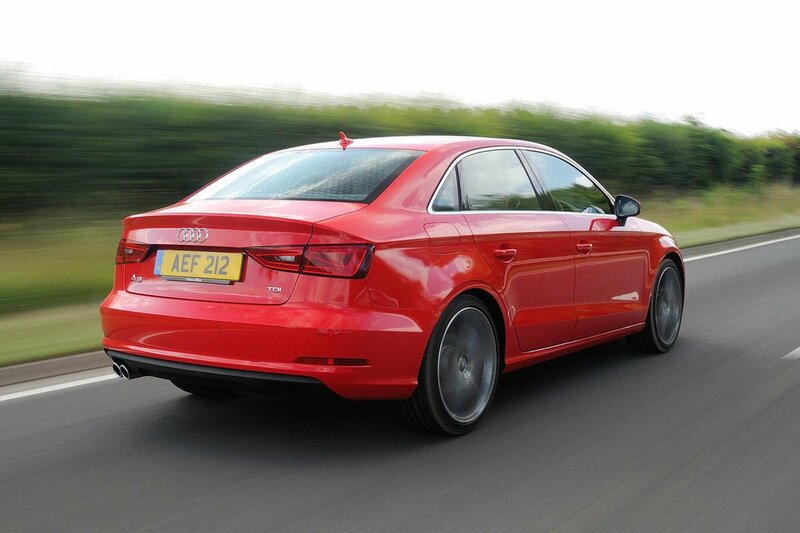 The whole package is capable, composed and makes the A3 easy to drive. If you crave absolute agility and deft dynamics, though, then the beautifully set-up, agile, rear-wheel drive BMW 3 Series should be top of your list, followed closely by the Jaguar XE. Audi offers Magnetic Ride — the adaptive dampers we mentioned above — as an option on S line versions (the S3 gets them as standard), but the mix of body control and comfort is so good on the Dynamic suspension that we wouldn’t bother ticking that box. The A3 Saloon needs to offer a hushed travelling environment if it’s to deliver on its promise as a smaller, cheaper premium option — and, in the main, it does. The petrols are smooth at a cruise (although the three-cylinder 30 TFSI thrums a little under load), but even the diesels aren’t too vocal once you’re up to motorway speeds, and are smoother than those in a 3 Series or Mercedes-Benz C-Class. It’s worth noting, however, that larger wheels do bring a lot more road noise, and this is one of the A3 Saloon’s weaknesses. It’s better on the smaller 17in alloy wheels (fitted to our favourite Sport trim), but even then it’s nowhere near as hushed as its bigger, traditional rivals, not least the A4. Wind noise isn’t too bad, however. Instead of disguising engine noise, the S3 Saloon celebrates it; one of its driving modes activates a sound actuator that feeds more of the motor’s roar into the cabin. It’s easy to turn off if you want a quieter cruise, though. The RS3 is noisier still but sounds so delightful you won't care a jot. The manual gearboxes are slick, but while the automatics change gear smoothly most of the time, they can be a little jerky when you’re manoeuvring.